Are pets allowed inside your store? Yes! They are more than welcome as long as they are on a leash or inside a carrier, and are well-behaved. But please walk them prior to entering so there are no accidents inside (we have a gravel walkway out front they are free to use). Can I get a dog license at your store? No. Sorry, but you have to call your local city hall or animal shelter. If you're in Vallejo or Benicia you can call the Benicia-Vallejo Humane Society at (707) 645-7905, the Vallejo City Hall at (707) 648-4345, or the Benicia City Hall at (707) 746-4225. Another place to get some good info on this subject is www.PetData.com so head on over there after you're done checking out our site. We CAN help get your dog vaccinated, though, and that's one of the steps in getting them their license. Please visit our Vaccinations page for more info. Do you sell dogs, cats, Rabbits? No. We sell just about everything you'd ever need for dogs, cats, rabbits (and other animals) but we do not sell dogs, cats, or rabbits here at our store. We have a bulletin board inside the entrance where some visitors post flyers selling/adopting out dogs, cats, and other animals (sometimes at no cost). Our bulletin board also features info on dog training, pet boarding/kennels, and more. 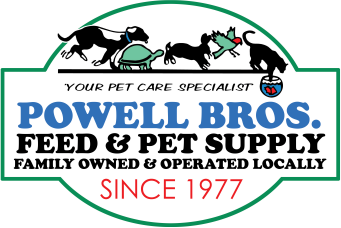 *Disclaimer: The advertisements, claims and opinions posted on the bulletin board are those of the poster and are not necessarily supported by Powell Bros. Feed & Pet Supply, Inc. or its staff. Do you sell propane tanks? Yes! We sell brand new 5 gallon (20 lb), pre-purged propane tanks with built-in gas gauge. Tanks are empty but we sell/refill tanks here. Can you fill a propane tank with no OPD valve? We cannot fill any 4lb to 40lb propane tank/cylinder that does not have an OPD valve. An Overfilling Prevention Device or Overfill Protection Device (OPD for short) is required for your safety and the safety of the person filling your tank. Click here to see a side-by-side comparison of the old (typically 5-pointed) and new (always 3-pointed/triangular) valve. Do You Sell Restricted Livestock Drugs (RLD)? No. We do not have a RLD License that would be necessary, along with a prescription from a veterinarian, to sell a Restricted Livestock Drug (RLD). There are new requirements as of January 1, 2018. Click here for a RLD List. How will the Antimicrobial Use and Stewardship Services Law* (SB 27) Impact Livestock Products Sold in Retail Stores? Click here for a Retail Drug Flowchart to help clarify how the new law impacts California in regards to medically important antimicrobial drugs (MIADs). Yes, as of March 27th, 2019, we do sell Penguin Brand Dry Ice! Is this the cab company?